William of Mass Destruction: More Adventures In Bad Photography. More Adventures In Bad Photography. You know, you do look rather perturbed by your mom's bad efforts! 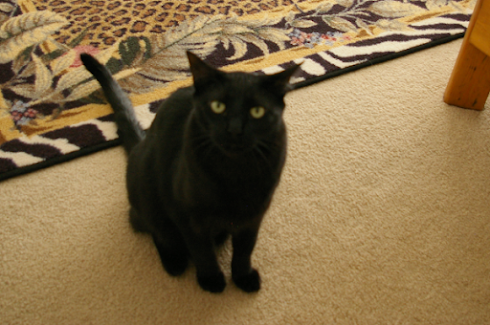 Sometimes, those "smart" cameras have a difficult time focusing on a solid black kitty. At least none of your body parts were cropped off. I think your commentary alerted her to her error! Well, we think you look good. Oh, the criticism in your ears! You look terrific but that rug sure isn't cooperating! Ivan, are you sure you weren't vibrating at a frequency too high for the camera to capture you properly? Call it a romantic misty focused shot!